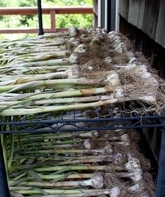 Curing garlic begins with a week of open-air drying. Then we cut tops back to 4 inches, trim roots to 1 inch, and dry for another 10 days. Finally, we trim and rub clean one last time, and the garlic is ready to store. 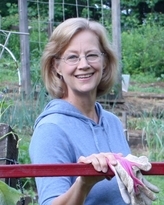 Be sure to read my GrowVeg blog on Harvesting Garlic: Happy Endings. There are lots of good follow-up questions on curing garlic in the comments thread. Some years are worse than others, but I always see some onion root maggots (Delia antiqua) in my garlic and onions. Egg-laying is heaviest in late May, so I may try catching a few in yellow sticky traps. Cured garlic and onions that host onion root maggots emit a pungent smell, so they are easy to spot, and never make it into long-term storage. Check out my information page on growing garlic chives, a perennial allium that provides tender leaves in spring and fragrant white flowers in late summer. In the kitchen, fresh garlic chives harvested in early spring provide gentle garlic flavor for Asian soups or delicate egg dishes. It’s a good thing that I love to grow garlic, because I cook with it almost every day. Planted in October and lightly mulched through winter, our hardneck garlic produces tender garlic scapes in late May and early June, and both hard and softnecks are ready to harvest by the first week of July. Garlic curing takes at least three weeks, and six is even better. Our cured bulbs are stored in the basement, but they seem to do just as well at room temperatures. If we run out of good eating garlic in spring, we can pull a few green garlic plants from a half-wild patch outside the garden. 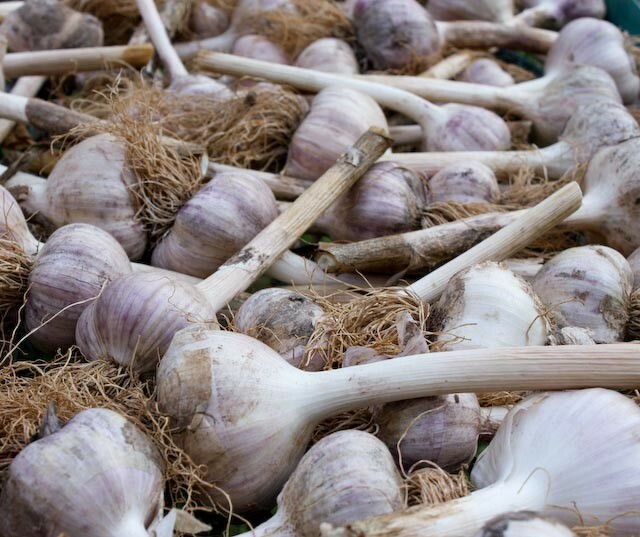 When you grow garlic, you know exactly how many bulbs you will get provided you start with fat, healthy cloves, because each clove you plant matures into a bulb. To have garlic all year, we grow precisely 120 plants – exactly how much we need to eat, replant, and share. 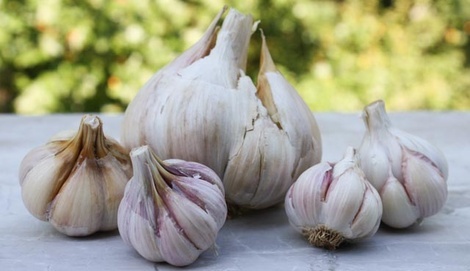 Easy to grow and store and a delight to eat, it’s no wonder that garlic came out on top in Mother Earth News’ Survey of Great Garden Crops in 2009. One of the things that made the survey unique is that is looked at the storage variable, an important aspect of a sustainable, home-grown food supply. That’s probably how garlic managed to beat out tomatoes as the favorite crop in the survey. 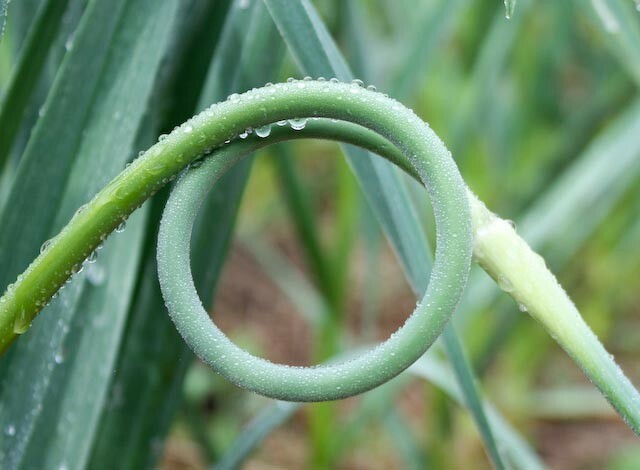 When hardneck garlic sends up its snaking scapes in late May, I’m ready to harvest every curl. I try to catch them just as the stem makes a full circle, because the scapes are big but still tender at that stage. Then I remove the tough blossom ends before using the scapes as an onion/garlic substitute in everything from omelets to etoufee. Garlic scapes will store in the fridge for a couple of weeks, but I blanch and freeze my extras. They’re one of the first frozen garden goodies to disappear, usually before Christmas. Like a lot of other gardeners, I've found that 'Music', a hardneck porcelain type, is a dependable producer of big, tender scapes and large, juicy bulbs. We also like ‘Spanish Roja’ (a rocambole) and an almost miniature strain called ‘Korean Red’. Although the bulbs (and plants) of 'Korean Red' are small, they are fabulous keepers, still plump and juicy in April. It’s important to give a garlic strains at least a couple of years to prove themselves, because garlic varieties will fine tune their growing rhythm to better adapt to the climate. 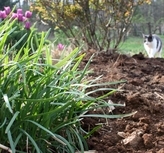 For good tips on how to grow garlic in your climate, see Plant Now for Great Garlic in the Mother Earth News archives. Hardneck garlic (left) sets cloves around a central stalk, and the tops of the stalks are harvested as scapes. Softneck garlic (right) lacks a central stalk, so the tops can be braided. 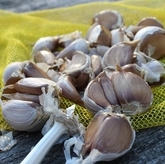 Softneck garlic bulbs are comprised of a cluster of cloves. Elephant garlic (rear) is actually a leek, but whatever. Elephant garlic grows well for me in Zone 6B, and the big, mild cloves are fun to have in the kitchen. These garlic bulbs have been curing for three weeks. They have been trimmed and cleaned once, and will get a second cleaning before they go into storage. I use scissors to cut off the dried roots, taking care not to damage the basal plate -- the plant part that will grow roots if the cloves are planted for next year's crop.